Loopmasters are proud to present Riddim & Dubstep, a ferocious and formidable assortment of cone melting dancefloor sonics that are best handled with care, because this flagship selection of mammoth sounds will cause serious damage wherever it's drawn for. Coming correct and 100% royalty free, this one can?t be overlooked by any serious producers of the new wave of Riddim & Dubstep sound! Dan Larson returns to Loopmasters and has been busy generating a new school flavours with an old skool attitude, Riddim & Dubstep rolls through with 860 MB of content to guarantee you've got plenty of artillery to shell down any dance. Included are some of the finest loops, one shots and sampler patches in the game, including dubstep bass loops, riddim drum samples, dubstep arp loops, riddim bass samples, pads, synths, FX, arps and much more, all meticulously crafted for maximum impact in context! Rolling out at tempos between 150 and 155 bpm, this collection works perfectly for the named genres, as well as any other hi octane dancefloor genres with a penchant for heavy bass, sci fi FX and ferocious vibes on command. In detail, expect to find 860 MB of total content with all audio recorded at 24Bit & 44.1 kHz. 187 loops are broken down as 64 bass loops, 20 full drum loops, 20 kick snare loops, 20 top drum loops, 19 synth loops, 11 pad loops, 10 drum build up loops, 9 synth build up loops, 6 arp loops, 4 FX loops, 2 drone loops, 1 crash loop and 1 vox chant loop. 149 one-shots are divided between 78 drum hits and 71 bass hits. Also included are 81 soft sampler patches (for NNXT, Halion, Kontakt, EXS24 and Sfz) and 200 Rex2 files. 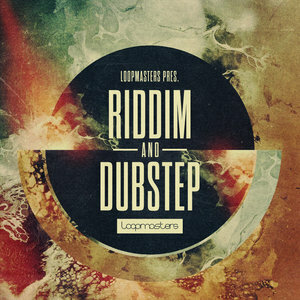 Riddim & Dubstep by Loopmasters is your free pass to a deep dark dubstep underworld.